Sweet Smash Story company Renatus Media has announced the release of its newest game on Facebook: Bubble Milk Hero. While storylines in match-three or bubble-shooting games aren’t typically the main attraction, the story here is a doozy. The game follows Supercat and his hamster sidekicks on a quest to save Earth from the alien invaders who landed in a small country house. The kicker? Only milk from space cows can help Supercat fulfill his destiny. Now that the game has your attention, gameplay in Bubble Milk Hero sees players completing level-based missions by shooting colorful bubbles at bubble formations hanging from the top of the screen. Players clear bubbles by making matches of three-or-more like colored orbs with these shots. Each level ends when players clear nine bubbles from the top row of the screen, and like the company’s Bubble Chronicles DE, Bubble Milk Hero focuses on a fuel system for taking shots, rather than a move limit for each level. Players have an overall milk meter that carries across the entire game. So long as players have milk, they can shoot orbs during levels. Each level cleared results in a new space cow that can be milked throughout the day, so the more levels players clear, the higher their milk production rate. In addition, the more points scored per individual level, the better these earned cows are. A brown cow may produce 20 milk per hour, for instance, while a golden cow generates 50. Users can replay stages to earn better cows if they’d like. For social play, gamers can collect milk from their friends once per day, and users can compare their high scores with their friends’ scores while playing. Sharing progress updates also gives users free milk bonuses. While Bubble Milk Hero is free-to-play, users can spend real money on a series of boosts as well. These boosts are represented by Supercat’s hamster friends, and may unlock trajectory lines for shooting bubbles, rainbow bubbles that can be used to clear any bubble in the formation, a third bubble to the bubble shooting set (players can hit the space bar to toggle between active shots), and so on. Players can even purchase a larger fridge, which increases their maximum milk capacity. Back at the level map, players receive free spins on a prize wheel every day, and can unlock special “Key” levels by collecting a large number of golden space cows. 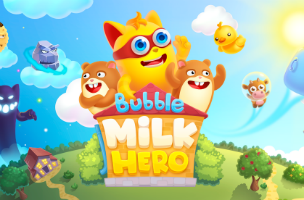 Bubble Milk Hero is available to play for free on Facebook.